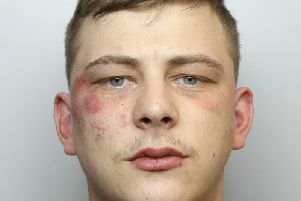 The face of one of the ‘Most Wanted’ individuals in Leeds is set to be broadcast across the UK by Crimestoppers this week as the charity marks 10 years of its Most Wanted online gallery. Kyle Benjamin Major is aged between 20 and 25 and is wanted by West Yorkshire Police on suspicion of five offences including domestic violence, robbery, damage and threatening behaviour. He is also wanted on a warrant for breaching a court order issued by Leeds Magistrates Court and is known to have links throughout the Leeds area. He is around 6ft tall, described as slim with black and curly cropped hair. His face has appeared with others wanted by UK police forces on a van fitted with a large digital screen that launched in London on Tuesday before travelling to towns and cities across the UK – arriving in Leeds this Saturday. The Most Wanted tour comes exactly 10 years after Crimestoppers’ Most Wanted online gallery was launched in the UK. To date, the site has listed a total of 12,524 appeals – 3,589 of which have been arrested. Lord Ashcroft KCMG PC, Founder and Chair of Crimestoppers, said: “Most Wanted continues to be a success a decade after we launched it and we wanted to celebrate this milestone. “A huge number of those who have been listed on the website have been arrested over the years and we hope this Most Wanted tour of the UK will increase that number. “The digital screens will be hitting the streets, possibly going in to the cities and towns where these suspects are hiding. Crimestoppers’ Most Wanted was launched on November 17 2005 and was, at the time, the first national online source of wanted individuals in the UK. The site initially provided photographs and descriptions of known suspects before expanding to include an ‘unknowns’ section of CCTV images. The aim was, and still is today, to give members of the public the opportunity to give information about any of the suspects to Crimestoppers anonymously. It continues to be a useful tool for all of the UK Police Forces and wider law enforcement agencies. It has also become vital for several national and international fugitive campaigns – including Crimestoppers’ and the National Crime Agency’s Operation Captura, which seeks to find British fugitives hiding in Spain. Today the Crimestoppers Most Wanted site is proving to be as popular as ever – receiving around 30,000 views every month from the public. Gemma Wilson, Yorkshire & Humberside Regional Manager for Crimestoppers, said: “Most Wanted appeals to the nation’s ‘arm chair’ detectives – those who want to help fight crime from the safety of their own home and, above all else, anonymously. The Most Wanted anniversary will see a total of three vans fitted with large screens will travel 800 miles between them as they hit the streets of major cities on a tour through England, Wales and Scotland.